Kobelco introduces the SK400D, which is our latest demolition machine available in Europe. The machine comes with an exclusive NEXT attachment joint so that you can set up or change work fronts quickly and easily to get the job done. The scale model for this machine has been produced in the scale of 1:43 and includes the NEXT system in the box. Click here to buy this model. You can read the review in full here with detailed photography or read it below. At the 2016 Bauma trade show, Kobelco announced a new generation demolition rig, purposefully designed for demolition both at height and for foundation demolition. The SK400D NEXT is due to be introduced into the European market during 2017 and in preparation for the launch, a 1:43rd scale model has been produced to demonstrate the various configuration and functional aspects of the design. The box contains a comprehensive set of parts including two booms, an intermediate extension boom, several sets of stands, pins, linkage brackets and two different demolition attachments. The undercarriage has extending track frames which are fitted with individually linked plastic track pads with double grousers. Surface detailing of the frames is minimal with rotating drive and idler wheels. One of the features of the new design is the detachable counterweight system and this is functional on the model, with the weight dropping into a frame at the rear of the body. The cabin has a replicated interior showing the track control levers, driver’s seat and hand controls with protective screens covering the front and roof window. The short demolition boom consists of a two section main boom which can be hydraulically adjusted with a stick fitted which connects to the largest of the demolition attachments. A plastic moulding is included which holds the linkage in position when no attachment is fitted and this is a nice touch. One of the features of the new system is that all the hydraulic lines are located on the sides of the boom to make connecting them up achievable from the sides, thus making is safer and this is replicated with raised lines cast into the boom sections. The three-piece high reach boom has an interesting design with the hydraulic cylinders arranged in an X pattern which reduces the overall height of the boom during transport to within 2 metres and this is nicely implemented on the replica with stiff hydraulics allowing any pose to be realised. An intermediate extension boom is included and can be used with either main boom configuration to increase working height. Connection of the booms with the base boom is made with specially formed plastic pins that extend, simulating the hydraulic pin system found on the full sized unit. Two different sizes of plastic stands are included allowing all the boom components to be displayed disconnected from the base machine and this too is a good addition to the package. All the boom components are made of plastic and there is a high plastic content throughout the model, while still maintaining a fairly heavy weight, certainly enough to prevent it toppling over at full reach. The pair of demolition attachments are similar to each other and both have opening jaws and 360 degree rotation of the body with good surface detailing. 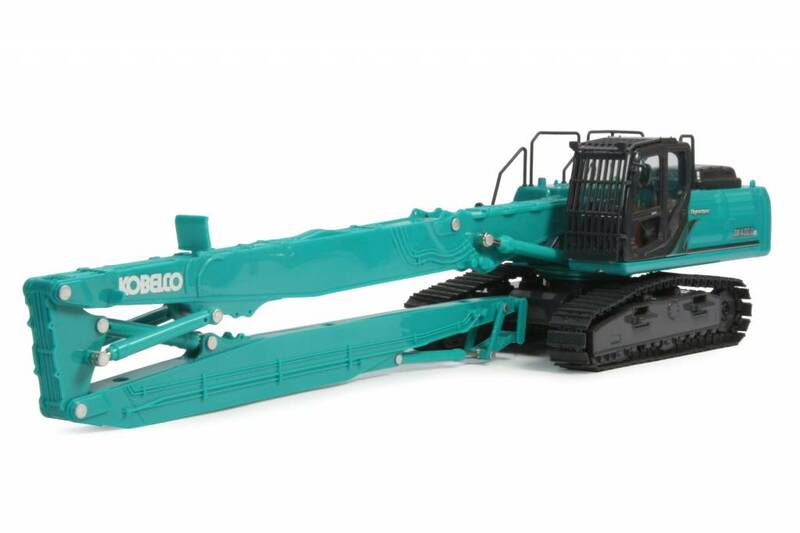 Many of the currently available Kobelco excavator models are produced in 1:43rd scale however during 2017, it is believed that new dash 10 model excavator introductions will be in the more favoured 1:50th scale and Kobelco are planning a new online merchandise webshop which should be up and running later in 2017.